I’ve just returned to Ireland after completing the three week summer programme at The Galilee Centre for Studies in Jewish-Christian relations which is based at The Max Stern Yezreel Valley College. What a location it is! Equidistant from Megiddo to the west and Nazareth to the north, the College is ideally located as a base to explore the land, expand your thinking and build relationships. As a seasoned visitor to Israel, leading study tours for Christians twice a year, I was excited about going as a student this time. I wanted to be refreshed and to “take in” rather than “give out”. Often I say to my groups that they must wear tri-focals if they are going to appreciate anything of Israel. I found myself using those very lenses throughout this course planned by Dr.Faydra Shapiro, who directs The Centre. This summer course provided a splendid opportunity to relate past, present and future as well as land, people and book. The three weeks simply flew by. On three of the days each week there were two lecture streams. Dr Brad Young set “Jesus in his Jewish matrix” with consummate skill while Dr.Shapiro helped us explore the intricacies and challenges of “Jewish – Christian dialogue”. As a Christian, I felt that I had a lot to learn even though I’ve devoted much of my life to teaching Christians about the Hebraic context of their faith. However this course was not confined to the classroom. Mondays saw us out and about all over the Galilee on field trips ably guided by an enthusiastic rabbi by the name of Ross Singer. He carried his knowledge lightly and communicated it with great warmth and humour. Wednesdays were community days which took us into the world of the Emunah foster home in Afula and then out into the fields to glean vegetables for the less fortunate. Fridays and Shabbats were our own to either travel or simply catch up on the week. A Shabbat meal with the Shapiro family and a trip north to visit the Aramaic speaking Christian church in Gush Halav were among some of the ‘extras’. It is unthinkable to any decent human being to desecrate the final resting place of an other person, yet that is what a group of young people did in broad daylight in Belfast on Friday. However, this was no mindless act of vandalism, but an apparently targeted and premeditated crime. The eight or so youths involved, armed with hammers, climbed a wall that surrounds the Jewish sector of Belfast City Cemetery in west Belfast. There they proceeded to smash headstones and, even more unforgivably, attempted to gain entry to the graves. This had all the hallmarks of a hate crime and is an obvious expression of anti-Semitism. Like most similar crimes, any rationale that may have provoked the youths to carry it out has no basis in reality. Ulster has a long, and it has to be said, proud association with the Jewish community. One of Belfast’s outstanding Lord Mayors, Sir Otto Jaffe, came from that community, as did Chaim Herzog, who went on to become the sixth President of Israel. Gustav Wolff, of what was once one of the greatest shipyards in the world, Harland & Wolff, was Jewish. These are people who brought great acclaim to the province, or more specifically, Belfast. They helped make it an industrial powerhouse. Those who attacked the graves of their peers, descendants and fellow citizens have brought nothing but shame on the city, branding it the home of bigots. Why would Jewish graves be singled out in a west Belfast cemetery? We will not know the definitive answer until the perpetrators are caught and explain themselves, but there has been a concerted anti-Israeli campaign in that part of the city for many years as republicans have sided with Palestine against Israel in the seemingly unending Middle East conflict. Perhaps these youths have seen that political expression as an excuse for something more hateful, using hammers and blocks to demonstrate their anti-Israeli feelings, since they obviously don’t have the vocabulary to do it otherwise. We couldn’t expect them to know that Chaim Herzog’s father was known as the “Sinn Fein Rabbi”, because of his support for the republican cause during the Irish War of Independence. But then that would not tie in with Sinn Fein’s narrative on the Middle East of today. The people of west Belfast must know who carried out this hate crime, and they need to give that information to the PSNI. 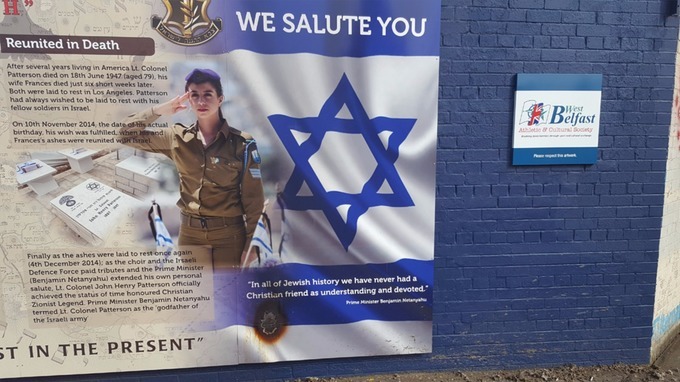 As a result of a futile, intolerant and deliberately provocative attack on the impressive Colonel Patterson memorial in Northumberland Street hundreds of thousands of people are now aware of a remarkable connection between Belfast and Israel. The story below is from the main ITV news website. NIFI joins those condemning this attack on diversity and tolerance and supports those calling for calm after a series of attacks in the city. As a group we will work with the local community to restore the display and ensure the Jewish and Israeli connections with Belfast are properly and honourably commemorated and never erased. In this we expect the support of all political parties and groups. Police say they are treating an arson attack on a memorial recognising the contribution of Jewish soldiers in the World Wars as a hate crime. It is understood at around 1.30am on Thursday morning, two containers of flammable liquid were set alight next to the memorial at the junction of Beverley Street and Northumberland Street. The memorial relates the history of Colonel John Henry Patterson, from Co Westmeath, who had a distinguished war record and notably led the Zion Mule Corps, dubbed “the first Jewish fighting force in nearly two millennia” who fought in the Gallipoli Campaign of the First World War. It also incorporates a panel highlighting Patterson’s links to the Jewish state and a quotation from Israel Prime Minister Benjamin Netanyahu describing him as “the godfather of the Israeli Army”. Speaking to UTV, Pastor Paul Burns, from the Adullam Christian Fellowship in the Sandy Row area of Belfast, said he was saddened by the attack, which he believed was anti-Semitic. Pastor Burns, who has Jewish heritage, said it was particularly upsetting, coinciding with a deadly attack in a Tel Aviv market, that left four Israelis dead. He said Belfast’s small Jewish community had been “deeply hurt, deeply alarmed” by the incident. William Humphrey, a DUP MLA for the area said the attack was “clearly designed to raise tensions,” coming as it did, on the back of several instances of vandalism of a war memorial in Woodvale Park. He said the memorial was “welcomed in the community, in Shankill, but also by the Jewish community as it showed the historic links between Belfast and Israel”. Mr Humphrey called for calm and said those behind the attacks “need to take a long look at themselves,” as “those whom the memorial commemorates have done a great service to freedom and democracy”. A police spokesman has appealed for anyone who witnessed the incident or anyone who has any information to contact officers at Tennent Street on 101. Alternatively, information can be passed anonymously via the independent charity Crimestoppers on 0800 555 111. On the eve of the Festival of Passover Northern Ireland Friends of Israel wishes its Jewish supporters in Northern Ireland, Israel and around the world chag sameach – a joyous and peaceful Festival! On and around this date the March of Life will take place in many different cities in Germany, Europe and across the globe to remember and honour the memory of the victims of the Holocaust. Lord Sacks on the meaning of life and what Israel means to him. Lord Jonathan Sacks, former chief rabbi, discusses the meaning of life and faith with Gay Byrne – and gives his take on what Israel means for him.